I Buy Way Too Many Records Dot Com: Mrs. Magician - Friday Night 7"
Number two in the Windian Singles Series is from one of my current favorite bands in the world, Mrs. Magician. I will admit, one of the reasons why it's taken me so long to get around to writing about this box set is because I didn't want to listen to this Mrs. Magician 7" after the band had announced they were splitting up. Their last full length, Strange Heaven, was just so perfect and my feeble brain couldn't cope with the fact that a band would walk away after releasing something that good. Luckily, they changed their mind, got back together and are about to disappear into the ether to record their new album. 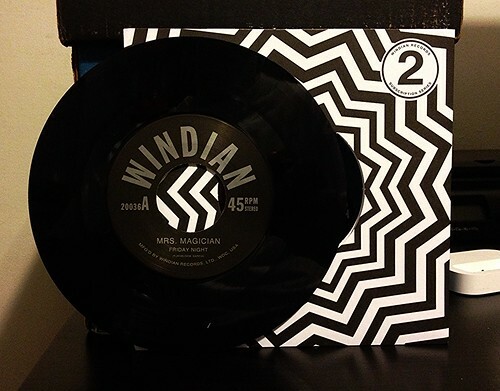 This allows me to listen to their Windian 7" with joy and anticipation rather than treating it like a funeral. It's a relief too, because these 2 songs are incredible. If they were the last 2 Mrs. Magician songs ever released, it would have been a shame. But they're not so I can rejoice in the Beach Boys gone bad harmonies of "Friday Night." With very light organ searing through the background, this song picks up right where Strange Heaven left off. Everything peaks with a soaring, clap your hands along chorus, but then just to keep things interesting the band cuts everything to half time (I don't know if that is a completely technically accurate term, but they make the song slower) and ride out to the conclusion repeating "She was speaking in tongues, just like an angel." The B-side, "Crosses," takes things into a slightly different direction. The tone is more reminiscent of "Don't Flatter Yourself," where the band manages to take a reasonably slow song, but turns the dark factor way up. Yet somehow, they manage to sneak in a ton of hooks and a chorus that rings out "I'm alright, I'm all ri-yi-yi-yi-yi-yi-yight." It's just such great stuff. I am counting down the days until I can hear more new music from Mrs. Magician. They are pretty much the best band playing music right now and I just hope they can manage to stay together for many, many years to come. Been googling around for the sold-out Mrs. Magican - Strange Heaven Vinyl this week. Stumbled upon this blog post. Yeh man, they are definitely in my top 3 favorite new rock-oriented bands/albums with maybe these albums: The Orwells - Remember When, and IAMDYNAMITE - Supermegafantastic. For more popular bands, the Arctic Monkey's last album I thought was really great even before the 6months it took to get popular/radio-play in the U.S. here. Franz Ferdidand's last album was really great/catchy as well, unfortunately no radio-play for them at all. What are your favorite rock-oriented albums that have good catchy-hooks/melodies of the past couple years?